Four nights over Two weekends! Tickets also available for this show at BOT for the city-wide Fertile Ground theater festival. We will honor 15 passes per show. 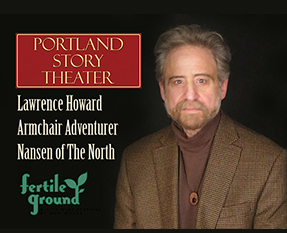 If you do buy a Fertile Ground Pass, please designate Portland Story Theater so we can earn some of the proceeds from your purchase. Thank you! Before Amundsen, before Scott, before Shackleton, there was Fridtjof Nansen, the great Norwegian, the Father of polar travel, the one who showed them all how it could be done. Adventurer. Scientist. Explorer. Humanitaran. Nansen, who made the first ever crossing of Greenland on ski. Nansen, who locked his ship in the Arctic ice and tried to drift over the Pole. Nansen, who famously said that it is better to go skiing and think about God than it is to go to church and think about skiing. Join us in January, 2017, for a brand new installment in the Armchair Adventurer series: Nansen of the North.